SoftBums Echo is one of our all-time favorite diapers. Truly a one-size diaper that fits most babies right from birth, we love this made-in-the-USA AI2. Read our full review below to find out why! While many cloth diapers are "very similar" with a few slight modifications, I have yet to find a diaper that compares to my SoftBums! I really do think it is unique in the market, and there are lots of things I love about this brand! I love the size range and ease of use with this diaper. SoftBums has a "slide to size" feature, which is really tiny little sliding adjusters on the leg elastics. 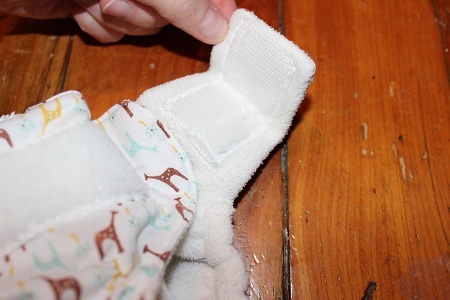 You reach in a small opening in the front of the diaper and quickly adjust the elastics to the perfect size. They size down to an incredibly small fit, and we had no trouble using these on a 35 lb toddler either! While they are available in snaps now, SoftBums originally launched with Aplix (Velcro) closures. I wasn't a fan of Velcro with a lot of my diapers, but in this design, it works for me! Personally, I wouldn't even bother trying snaps, because this really was the "never fail", anyone can use diaper I had imagined must exist! I only wish this brand had been on my radar when I started with cloth in 2009 and thought pockets were the only way to go! 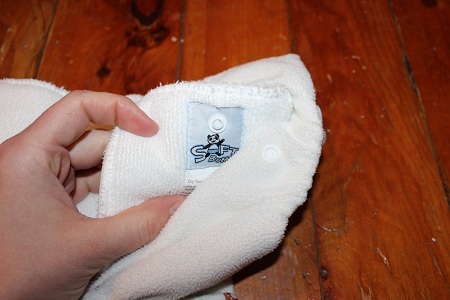 The inside of the SoftBums is lined with a soft fleece. While some of my older ones have pilled, my friend just bought some new and she says the newer diapers use a different fleece that has not pilled as much as mine have. 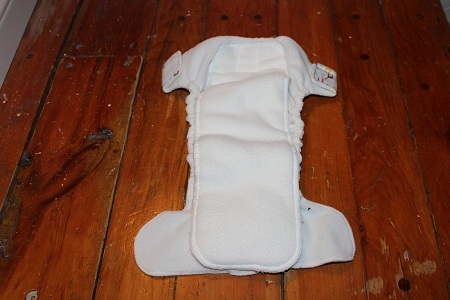 Pilling does not affect the function of the diaper at all, and I still find it is incredibly soft! 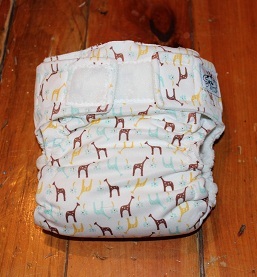 The SoftBums Echo has a waterproof PUL outer, and they have ADORABLE prints! Every month, they launch a new, limited edition Calendar Bum print. People even collect them, and there is quite a re-sale market for used SoftBums in hard-to-find prints! You can click on the link to learn more about their special edition prints. 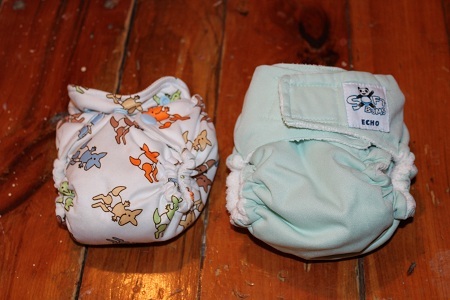 As with other AI2s, SoftBums has removable inserts that can be changed without changing the whole diaper. The benefit of this is that the shells can be reused if they are not soiled, and the diapers also dry faster than all-in-ones. SoftBums inserts snap into the Echo, which means that when your baby squirms, the insert stays put! 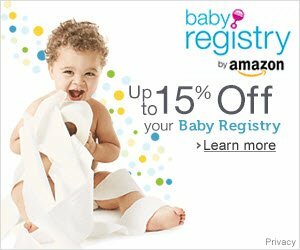 Trust me when I say this feature will be important when your baby grows into a toddler! There are several options available for the inserts. I am going to be completely honest - I have only tried the stay-dry inserts in my SoftBums. 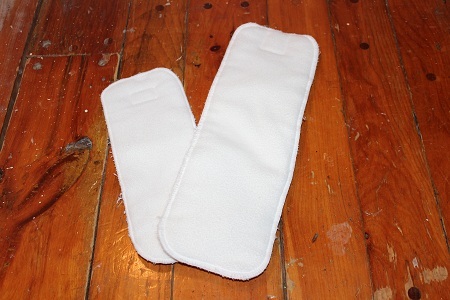 They are a thirsty microfiber pad, topped with a soft milled fleece that quickly wicks moisture away from your baby`s bum. Many of my readers love the bamboo pods, which are a more expensive but incredibly absorbent option that works well for night-time. Below is the stay-dry insert as well as the newborn insert, which can be added in as a doubler later if you need more absorbency. This is an incredibly flexible diaper that really does fit from newborn (a bit bulky, but a good fit!) right up until potty-training (the Omni does provide a bit more "coverage" than the Echo does, but rise and waist adjustments were fine for us. Yes, on a scale of 1 to 4 (with 1 being never, and 4 being absolutely! ), I give the SoftBums Echo a 4. With Velcro closures, this is an absolute favorite of mine to recommend to new parents. I love that the shells can be re-used more than once, cutting down on laundry, and that there are several absorbency options. 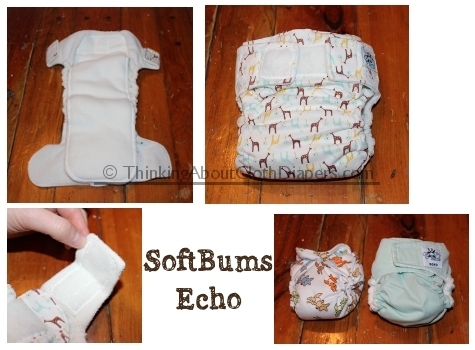 If you want to get your baby into cloth soon after birth, but don't want to invest in sized diapers, the SoftBums Echo is one of my top picks! Honestly, I wouldn't change much about this diaper! It was a later addition to my stash, but I plan to purchase more of them next time around. SoftBums diapers make me happy because I know they are reliable and so easy to change. They will definitely be my go-to diaper for daddy, daycare, grand-parents - and me! US - Dearest Diapers sells the shells, inserts, and starter kits. They also offer a reduced price on larger orders. 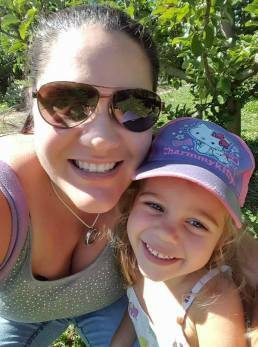 Canada - Lagoon Baby sells shells, inserts, and starter packs! Disclosure: I did not receive any form of compensation or free product from SoftBums in exchange for this review. I already loved SoftBums and was more than happy to help share more information about this diaper brand because it's one of my favorites. The opinions expressed in this post are entirely my own, and your experience with the product may differ from mine. I only recommend products or services I use personally and believe will be good for my readers. This article contains affiliate links. I am disclosing this in accordance with the Federal Trade Commission’s 16 CFR, Part 255: “Guides Concerning the Use of Endorsements and Testimonials in Advertising.” For more information, see our Disclaimer and Copyright.